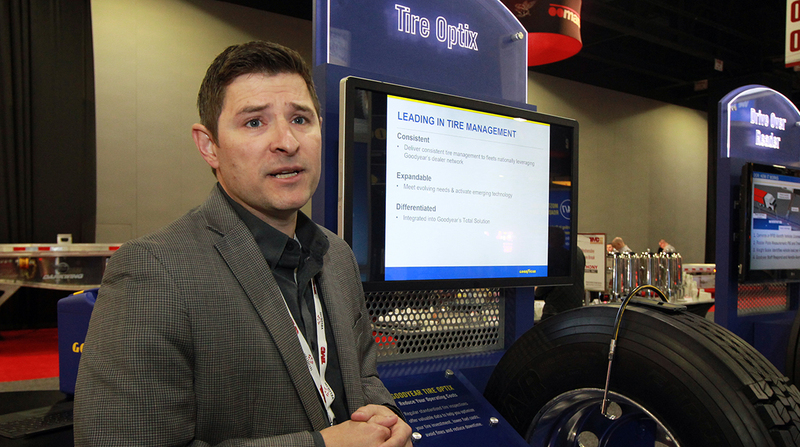 ATLANTA — The Goodyear Tire and Rubber Co. announced a new subscription-based mobile tire management program, Tire Optix. It is intended to help fleets add consistency to the process of managing a top cost across their entire network. Tire Optix, available through Goodyear dealers, measures tread depth and tire pressure with a single digital tool that also can take photographs. It’s tied to a cloud-based software platform that houses the readings, making reports immediately available. The software generates three reports: a list of items or exceptions that need to immediately be resolved, a tabular summary of everything that was observed and charts and graphs illustrating the percentage of specific conditions. Bluetooth technology is not new, nor are apps, Johnny McIntosh, general manager of commercial business solutions, told Transport Topics. “We focus a lot on the technology, but that’s not the biggest element of the program. It’s really about how we activate that network to provide consistency of process and data, especially for large fleets that are moving around,” he said. For fleets, tires are typically the second-highest maintenance expense behind fuel, cause 50% of roadside failures and can be the second-leading cause of roadside citations, McIntosh said. “We have to be able to solve the problem [with a tire]. That’s where we connect our entire dealer network. The tire intelligence is gathered into our tire management program and then tied into our service capability, and a fleet’s headquarters,” he said.